Taste of Italy: Tortellini vs Tortelloni, do you know the difference? I wonder why so many people ask me about cheese tortellini. Perhaps someone at some point must have gotten the tortelloni and tortellini mixed-up or maybe someone began stuffing the tortellini with cheese thinking it wouldn't make any difference. Ha! that's because they don't know the Bolognese take their food extremely seriously - as seriously as some people take their sports teams. Tortellini, stuffed with meat, are a specialty of Bologna and they are served in a brodo (soup). The pasta stuffed with cheese are Tortelloni and they are traditionally served in a sage and butter sauce so you can taste the amazing and light stuffing. 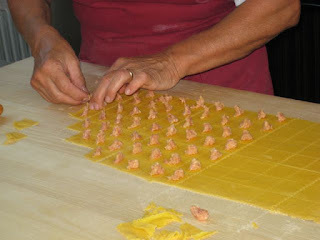 There is a very logical reason why tortellini and tortelloni differ in size and it has to do with the filling: the cheese filling is flavorful but delicate, you need more of it in every bite so you can actually taste it so it must be larger. The tortellini filling on the other hand is extremely flavorful and so you don't need a lot of filling to actually taste it. The tortellini, with emphasis on the ini because they are tiny morsels, are some serious work. In the tortellini class we make the stuffing according to the recipe deposited at Bologna’s Chamber of Commerce, we make the brodo and then we roll the dough so thin we can actually read a recipe through the dough…yes, that thin. Its a lot of work which is why I keep the tortellini from scratch lesson for advanced students or one of my student's 2nd or 3rd lesson. By the way, putting a larger amount of the tortellini stuffing in a larger pasta square is not a good idea. It would totally overwhelm your palate then nothing else you ate would seem tasty. Italian food is about balance and allowing our ingredients to speak for themselves. In terms of how many you need to prepare per person- you should plan on preparing anywhere between 6-8 tortelloni per person while you will need around 20 tortellini per person. Hence, why the tortellini are a lesson by themselves; we usually spend the entire lesson just making enough tortellini to eat. Oh and one last thing, anyone who serves tortellini in anything but a meat broth would probably be ostracized in Bologna! Some youngsters prefer the tortellini in a cream sauce so you might find it served that way - but do not ask a waiter for it, you might get scolded, just check if its on the menu. Anyway, just some information about Bologna's signature stuffed pastas!